Sometimes a little cigar isn’t just a little cigar. Looks like several of the gals weren’t willing to ruin their hairdos for a guy with a little cigar. Oh well, at least the balls are big. Winchester. It’s a whole ‘nother ballgame. 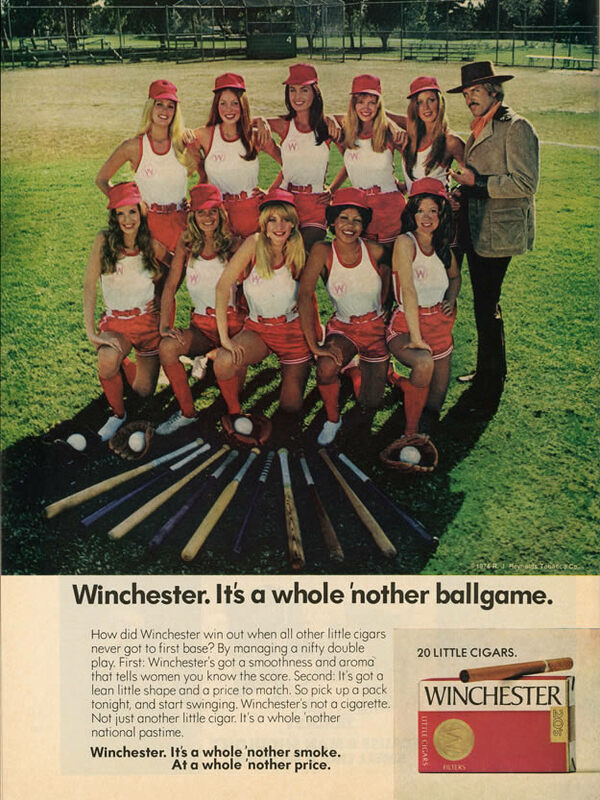 How did Winchester win out when all other little cigars never got to first base? By managing a nifty double play. First: Winchester’s got a smoothness and aroma that tells women you know the score. Second: It’s got a lean little shape and a price to match. So pick up a pack tonight, and start swinging. Winchester’s not a cigarette. Not just another little cigar. It’s a whole ‘nother national pastime. Winchester. It’s a whole ‘nother smoke. As a whole ‘nother price. This entry was posted in ads of yore and tagged ads, advertisements, advertising, cigar ads, cigarette ads, cigarettes, cigars, magazine ads, print ads, smoking, smoking ads, vintage, vintage ads, vintage advertisements, winchester on January 17, 2017 by Clayton Hove.